4th Century CE. India. 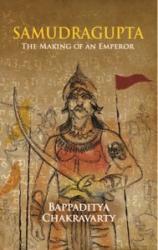 A prince is born to the Chandragupta I, the third in succession to the Gupta dynasty, ruling over a small kingdom. Predating Napoleon by more than a thousand years, he grows up to become as crafty on the battlefield as a Hannibal, as adept at annexation as a Bismarck, and, towering over all of them in statecraft. Samudragupta. The Emperor who ushered in India's Golden Age and laid the foundations of the greatest empire since the Mauryas: He brought peace and prosperity to a land divided, not only by religion, but also by small and large kingdoms and empires in the subcontinent. And survived plots against him. The novel relates how Samudragupta, a middle son, becomes the Crown Prince, inheritor of politically fused kingdoms, and battles divisive forces to confirm his own way to greatness.